We were going to have Nick post a follow-up message but I got home from the hospital last night and after a good night's sleep my brain can hold a thought long enough to get some words down. This will be short. I've barely begun to fathom what I've just come through and am totally overwhelmed just to know I'm still here. The road ahead is daunting, but I've got a great medical team at Providence on the job, and am impressed by their thoroughness and professionalism. Much more later. What a joy to read your post (perhaps surprised by joy)... we continue to join with others in lifting you and your loved ones before the "throne of grace." Welcome home! Continued prayers for rest, healing and God's grace and love to surround you. Thankful that you are home again! 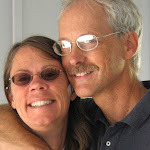 Many of your friends have been praying for you as well as for Ellen, Nick, Allison and her husband. You are a dear and wonderful friend to many of us. 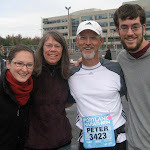 Peter, we too have joined the chorus of those praying for God's healing of your body and comfort for you and the family. Peter, I was delighted when you phoned to tell me that you weren't sticking around the hospital long enough for me to come visit. Home is the best medicine and I am glad you are there. Heal quickly - we are all praying for you.